Once while Jesus was standing beside the lake of Gennesaret, and the crowd was pressing in on him to hear the word of God, he saw two boats there at the shore of the lake; the fishermen had gone out of them and were washing their nets. 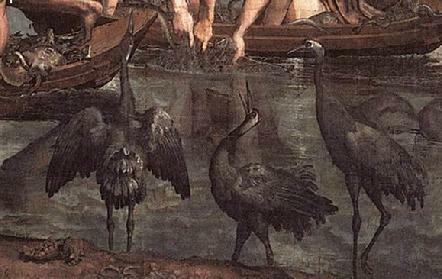 He got into one of the boats, the one belonging to Simon, and asked him to put out a little way from the shore. Then he sat down and taught the crowds from the boat. 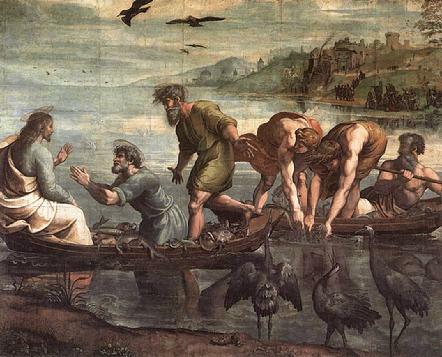 When he had finished speaking, he said to Simon, "Put out into the deep water and let down your nets for a catch." Simon answered, "Master, we have worked all night long but have caught nothing. Yet if you say so, I will let down the nets." When they had done this, they caught so many fish that their nets were beginning to break. So they signaled their partners in the other boat to come and help them. And they came and filled both boats, so that they began to sink. But when Simon Peter saw it, he fell down at Jesus' knees, saying, "Go away from me, Lord, for I am a sinful man!" For he and all who were with him were amazed at the catch of fish that they had taken; and so also were James and John, sons of Zebedee, who are partners with Simon. Then Jesus said to Simon, "Do not be afraid; from now on you will be catching people." When they had brought their boats to shore, they left everything and followed him. I'm a sinful man! cried Peter. But rather than dismissing these kinds of confessions as a mere rhetorical device, I think it's worth looking behind the scene - give saints credit for the insights they're taking the trouble to share. Ordinary people with ordinary character defects perceive the Un-Created Light, and their own shadows sharpen in contrasting clarity. Religious mystics testify that the journey of the unitive life takes on a weird paradox of proximity: the closer you draw near, the farther away you seem. This week's prompts begin with Peter's shock of recognition. He recognizes the Presence of God. He recognizes his own imperfections in light of that Presence. Jacob Boehme describes the shock of perceiving his own unworthyness by the light of Wisdom breaking forth within his own soul (Meditation One). Paul laments his weakness only to receive the revelation that God's power is made perfect in that very weakness (Meditation Two). But Macrina and Hildegard invite us to embrace the light as Reality within us, too, letting that deep interior light integrate into our character (Meditation Three). Boehme describes the soul's state after a period of conversion, repentance, and diminishment of ego. He describes the latent divine principle stirring within, and the appearance of Sophia, Wisdom. ...at which the Soul is so amazed and astonished in its Uncleanness that all its Sins immediately awake in it, and it trembleth before her; for then the judgement passeth upon the Sins of the Soul, so that it even goeth back in its unworthiness, being ashamed in the Presence of its fair Love, and entereth into itself, feeling and acknowledging itself utterly unworthy to receive such a Jewel. We have our treasure in earthen vessels, but Thou, O Holy Spirit, when Thou livest in a man, Thou livest in what is infinitely lower. Thou Spirit of Holiness, Thou livest in the midst of impurity and corruption; Thou Spirit of Wisdom, Thou livest in the midst of folly; Thou Spirit of Truth, Thou livest in one who is himself deluded. Oh, continue to dwell there, Thou who dost not seek a desirable dwelling place, for Thou wouldst seek there in vain, Thou Creator and Redeemer, make a dwelling for Thyself; oh, continue to dwell there, that one day Thou mightest finally be pleased by the dwelling which Thou didst Thyself prepare in my heart, foolish, deceiving, and impure as it is. Therefore, to keep me from being too elated, a thorn was given me in the flesh, a messenger of Satan to torment me, to keep me from being too elated. Three times I appealed to the Lord about this, that it would leave me, but he said to me, "My grace is sufficient for you, for power is made perfect in weakness." So, I will boast all the more gladly of my weaknesses, so that the power of Christ may dwell in me. Therefore I am content with weaknesses, insults, hardships, persecutions, and calamities for the sake of Christ; for whenever I am weak, then I am strong. The soul should know herself accurately and should behold the Original Beauty reflected in the mirror and in the figure of her own beauty. For truly herein consists the real assimilation to the Divine - making our own life in some degree a copy of the Supreme Being. Of sinners I am the chief!" you're nothing of the kind!" It occurs to me just now, after having loved this iconic passage from Isaiah my entire life, that maybe the tongs and the live coals were compensatory like the Scarecrow's diploma, the Tin Man's heart-shaped watch and the Lion's medal in the movie The Wizard of Oz. * Maybe it was just easier for the seraphim to do something to alleviate Isaiah's theophanic anxiety and perform a quick sin blotting rite than take the time to deal with a whole lot of explanation. How bad were Isaiah's sins anyway? But you, the reader, will probably reject this interpretation. It's too influenced by the “Stop grovelling” God in Monty Python's 'Holy Grail'. Or was that God in Ezekiel 2:1? Or Job 40:7-9? Also, do seraphim mess with us? Who can know the mind of a seraph? Okay, never mind. But it was a fun thought. You've got to expect a glitch in communication though, when you realize you're in the presence of the Holy when two minutes ago you were just sitting in a boat with some other sweaty guy who then tells you to put the net down in the deep side of the boat just a few feet away. A few feet, a couple of minutes, and suddenly you're prostrate on the bottom of the boat zapped both by the radiance of the Divine and the squalid excuse for the human person you realize you are in that Divine Light. Is Jesus messing with Peter? Let me put it this way; how often did Jesus mess with Peter? And, how often was Jesus TEMPTED to mess with Peter and didn't? It seems to me it is our squalidness that makes us beloved. Peter's sins endeared him to Jesus and Peter's imperfections endear him to us, not just across a boat and in minutes but across millennia. Our sins and imperfections are precious because they are the very substance of our transformation. I like what The Kotzker Rebbe said. “Your holiness shall consist of being truly human, not angelic. God has plenty of angels.” Besides, angels mess around too much. * The conferring of brains, heart, and courage involved more subtlety in the book. For example, the wizard made a mixture of bran, pins, and needles to put in the Scarecrow's head - “Bran new brains.” “Why are those needles and pins sticking out of your head?” asked the Tin Woodmen. 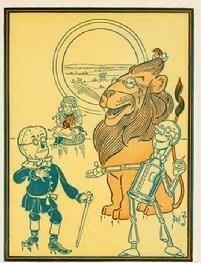 “That is proof that he is sharp,” remarked the Lion.